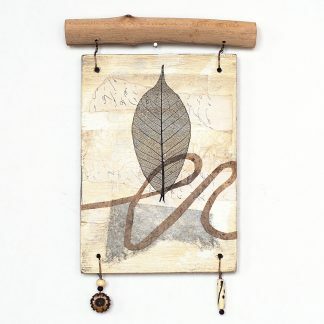 View cart “Mixed media wall hanging, abstract bird motif” has been added to your cart. Mixed media wall art, abstract bird design on reclaimed plywood. This assemblage incorporates reclaimed fence wire, antique brass finish wire, vintage buttons, and wooden and bone beads. Lovely pale violet accents neutral tones. Total height is 9″, total width is 4″. The plywood panel is 6″ high x 4″ wide.